Abelone is a Nord citizen who lives and works at the Windpeak Inn in Dawnstar. Her workday is divided between carrying firewood and doing various duties outside the Windpeak Inn. At 7am she will carry firewood for two hours and at 9am she will either lean against the fence of the chicken pen, use the grindstone, or chop wood at the wood chopping block. At 11am she returns to carrying firewood until she eats a one-hour breakfast on the bench at noon. At 1pm she returns to her random duties until 3pm when she spends another two hours carrying firewood. Her workday ends with yet another two hours of random duties until 7pm when she sits down on the bench for a one-hour dinner. The evening is spent inside the inn, socializing with the regulars. At 11pm she was supposed to go to bed for seven hours, and wake up to a one-hour breakfast at 6am, but doesn't, due to a bug. She wears a pair of boots, a set of clothes, and a cowl. She carries an iron dagger to defend herself. 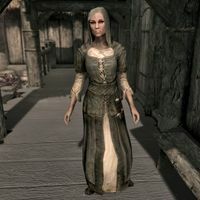 Speaking to Abelone while she is working outside will have her suggest that you head inside the inn: "I work for the Windpeak Inn. You should head on inside." Continuing to prod her for conversation will have her suggest you speak to her superior, Thoring: "Thoring runs the inn. Speak to him." Abelone was supposed to eat a one-hour breakfast at 6am but the package was accidentally set to noon. Abelone was supposed to sleep inside the Windpeak between 11pm and 6am, but her sleep package is not of the correct type. This page was last modified on 23 January 2015, at 05:20.